TED talks are great. They let you discover not only new ideas but also a new side to people and in this case to some of our favourite musicians. In this rendition of Music and TED talks, we have accumulated a list of talks by famous musicians who touch on the subjects of songwriting, innovation, human connection, human rights and some damn good music. So, starting off with Sting. You probably know him as the British musician who has brought us classics like “Fields of Gold”, “Englishman in New York”, “Moon over Bourbon street”, “Roxanne” and many, many more. But apparently mega stars also get writers block, believe it or not – they are human too. In this Ted talk Sting shares with us his origin story. He goes on to explain the processes he underwent when he was unable to create any music for a long period of time. He tells of the questions that kept popping in his mind and shares that going back to his roots, from which he had always tried to escape, helped him regain his muse. The result? Well, the score for the musical “The Last Ship”, which then became the inspiration for his eleventh album of the same name that came out in 2013. The talk is dotted with amazing performances, some of which brought a few tears to my eyes. Imogen Heap, whose real name is indeed Imogen Heap, is a British Grammy Award Winning musician, who has had music in her life from a very early age on. She was classically trained and learned to play piano, cello and clarinet. Her genres of choice include electronica, alternative rock, dream rock and indie rock. Heap has been a regular on TED, but in this particular talk, held in Cern, she tells about the innovative technology of the Mi.Mu gloves, which allow her to completely write and perform a song entirely with the help of her hand gestures. She starts by recounting the first time she and her team unveiled the brand new song-creating gloves, walking us through the experience, while at the same time creating a soundtrack with the gloves. Heap notes that the gloves allow her the freedom to create electronic music by stepping away from the computer box and allowing it to flow through her fingertips and the inspiration of her own sense of movement. The most impressive part of this talk for sure is the moment when she fully performs a song with the help of the gloves. Amanda Palmer is an American singer-songwriter and musician, famous for being part of The Dresden Dolls and Evelyn Evelyn. She is also enjoying a rather successful solo career. In her TED talk, she tells about the amazing education and experience she got from working as a street performer and how it has enriched her musical career. Palmer’s philosophy of searching for various ways to connect with others meets her with amazing people and makes her a collector of touching memories. In the talk, Palmer highlights how her ability to ask others for help led her to have the most successful musical Kickstarter campaign to date and in the process got her some hate, because what is anything on the internet without someone’s unsolicited criticisms. The focus of this talk is the idea of artists reconnecting with their fans by giving, receiving and asking. Peter Gabriel in an honest talk about how the human rights movement and his involvement in it has given him a great education on life and humanity. Gabriel is a renowned British musician, singer and songwriter. He is famous for being the lead singer and flutist in Genesis and afterwards for his successful solo career, which has earned him six Grammy Awards and many other prestigious prizes and recognitions. In this TED talk Gabriel talks about the “Witness” foundation, which gives cameras to human rights activist and teaches them how to safely, ethically and effectively expose human rights violations. The focus is on allowing everyone to share their story, give “a human face” to tragedies all over the world, bring awareness to what is happening to others on this planet. I don’t know about you, but I had never before seen Bono do anything but sing. So it was fascinating to see him in the role of talk-giver at TED. It is rather captivating. As I am sure you all know Bono, who is actually called Paul David Hewson, is the frontman and vocalist of the famous Irish group U2. The band has given us hits like “Where the Streets have no Name”, “One”, “Staring at the Sun”, “Elevation”, “Sunday Bloody Sunday” and much more spread among their 13 albums. Bono has always used music as an instrument for social change and highlighting various political, economic and religious issues. He is known for his philanthropic work and in this talk he highlights the progress that humans have achieved in reducing poverty and inequality. 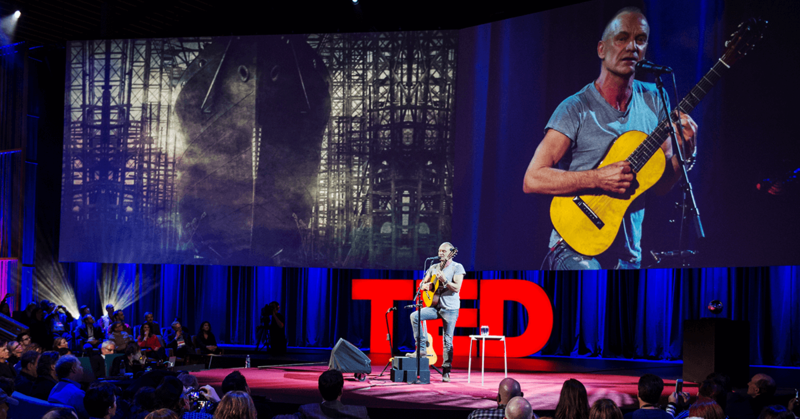 Finally, here is a TED talk literally all about music. Herbie Hancock is joined on stage by drummer Harvey Mason and bassist Marcus Miller to give us some sweet, sweet music. The 30-minute set is smooth, energetic, jazzy, funky and everything else you might expect from a musical legend like Herbie Hancock. Enjoy! Have you missed the previous TED talk on music articles? Find them in Drooble’s blog here and here. Make sure to also check out Drooble for more music!